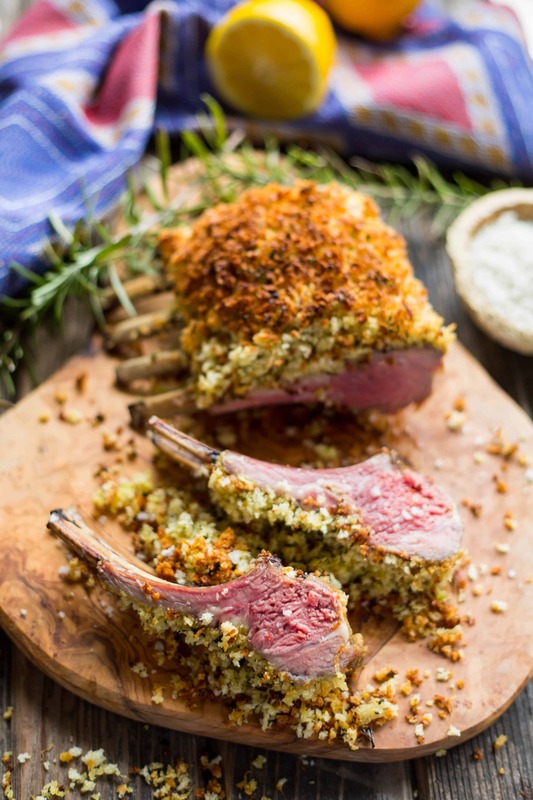 This Dijon herb crusted rack of lamb is an easy, crowd-pleasing, show-stopping dinner recipe! Succulent, juicy and full of flavor! In the restaurant industry, Valentines Day is affectionately known as “amateur night”. Along with New Years Eve, Valentine’s Day is one of those nights where you’ll find an overwhelming number of people out to dinner who don’t usually go out to dinner, while the regulars tend to stay at home. Couples flock to restaurants on this obligatory hallmark holiday in seek of special “for-two” menus that cater to lovebirds. If nothing else, it makes for good people watching. You’re bound to see a few guys trying too hard, you’ll definitely see at least one cliche proposal, and if you’re lucky, you might even get to watch a first-date-gone-wrong unfold before your very eyes. Personally, I hate going out on Valentines Day. All my favorite places are always super crowded and I get really uncomfortable with all the foofy-foofy lovey-dovey stuff. Chaser and I indulge in a fancy, formal sit-down-dinner once every year on August 27th, the day we tied the knot. But most of the time, we much prefer perching up at the bar and ordering apps in lieu of lingering over a 3-course-meal at a white tablecloth lined table for two. After all, we don’t need a designated holiday to celebrate our love. We do that every day by hiding in the dark and jumping out in attempt to scare the other person. Or making up song lyrics that make of each other. Isn’t that what all couples do? This isn’t to knock on anyone who likes going out on Valentines Day – we’ve certainly done it before, and I can especially see the desire if you have little rugrats at home. That said, isn’t it so much more special to make a really fancy homemade meal for someone you love – or better yet, have them make it for you? After all, how often do you actually cook prime steaks and decadent chocolate desserts in your own kitchen? It can be a fun activity to do together, or even more fun to surprise someone who would never ever expect it (cough, cough). 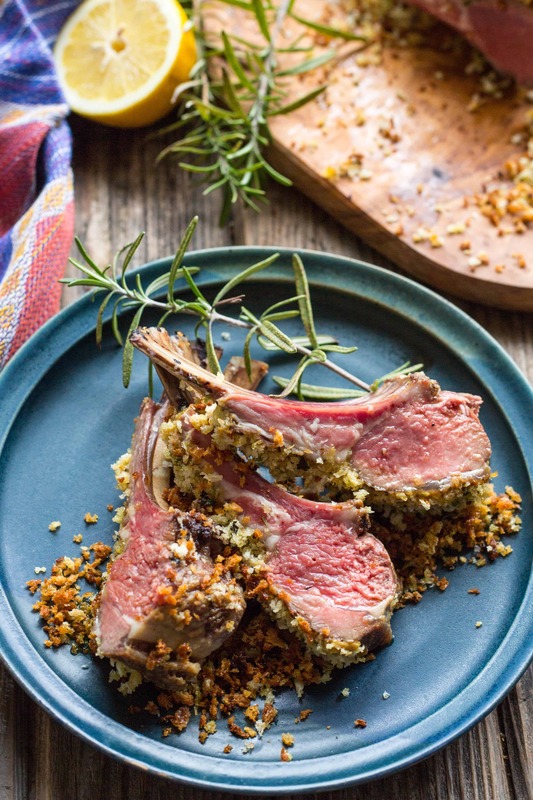 If you make steaks a lot at home, switch it up and try a rack of lamb instead. It’s a sophisticated cut of meat that, when roasted whole, is incredibly succulent, tender, and juicy. 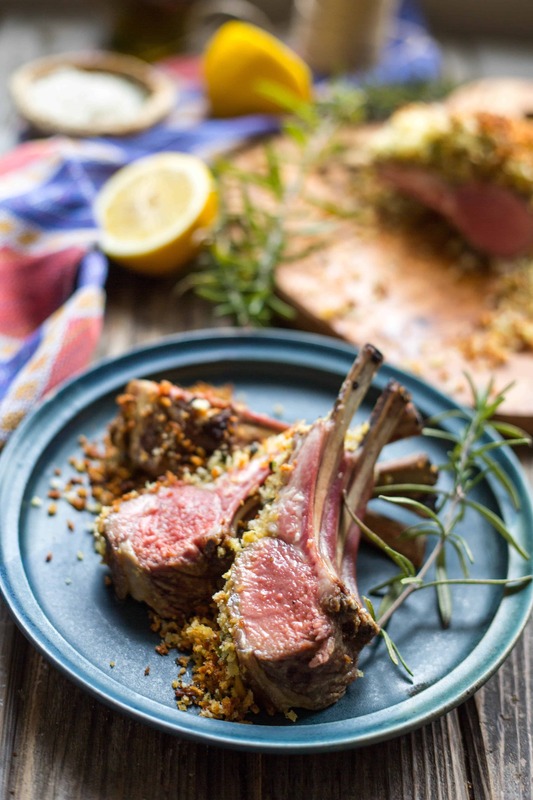 I happen to love lamb, but if you’re not sure how you feel about it just yet, this is a great recipe to ease you in. I don’t think of its flavor as being gamey, as some would describe. I think it has a mild, slightly mineraly flavor that’s tamed even further by the herbed breadcrumbs and tangy Dijon mustard. This recipe is not only easy to make, it’s also really elegant and impressive to serve. 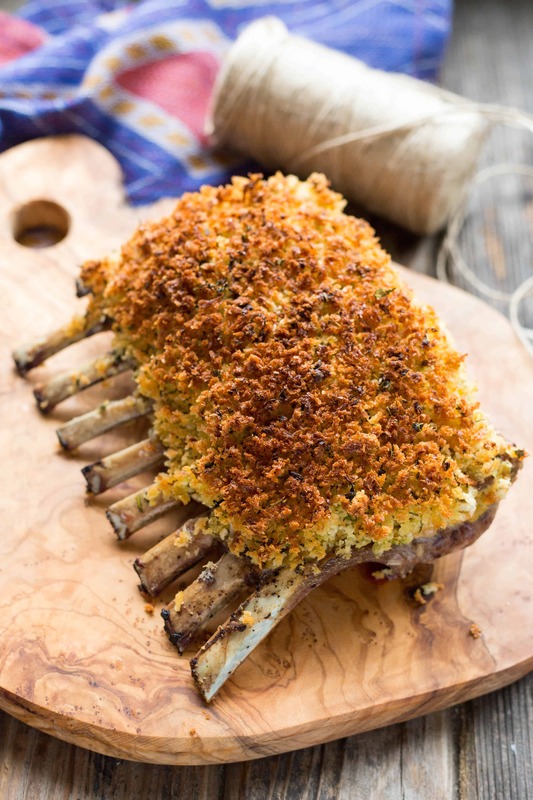 I can get big juicy chops from my local butcher shop, but when I’m making this for just Chaser and me, I like to get the smaller Australian rack from the grocery store. Coming in at around 1 1/2 – 2 lbs per rack, its just the right size for the two of us. 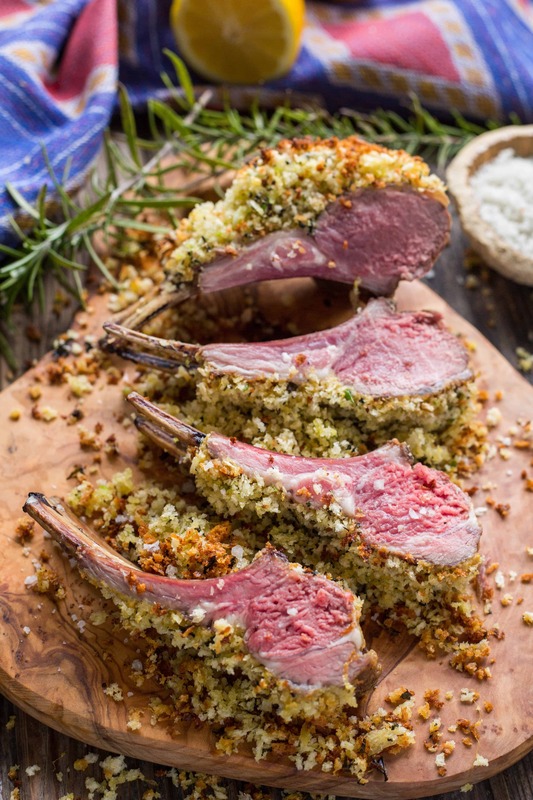 Rack of lamb is not a cheap cut of meat, but when made well, it makes a perfect treat for a special occasion. 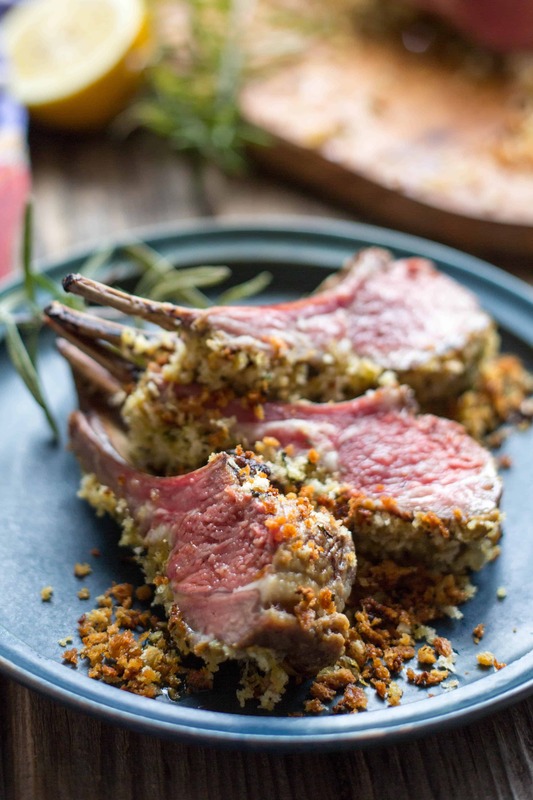 A rack of lamb will typically come with a hefty amount of fat on it. Look for one that’s been “Frenched” (0r ask your butcher to do it), which means that the meat, fat and gristle have been scraped away from the top bones. In most cases, I’ll leave on the fat cap so it can melt into the meat as it cooks, but for this recipe, it makes more sense to trim the majority of it off. That’s because we’re putting a really tasty crust of breadcrumbs, Dijon mustard and herbs right on top of the meat, and if there were a thick layer of fat in between, it would really complicate things. The key to this recipe, like a lot of other meat recipes, is a good probe thermometer. So many different things can factor into how long it takes for your meat to reach the perfect temperature – density, size, marbling, the temperature of the meat before it starts cooking, etc. You’re better off not risking it and just going the safe route. 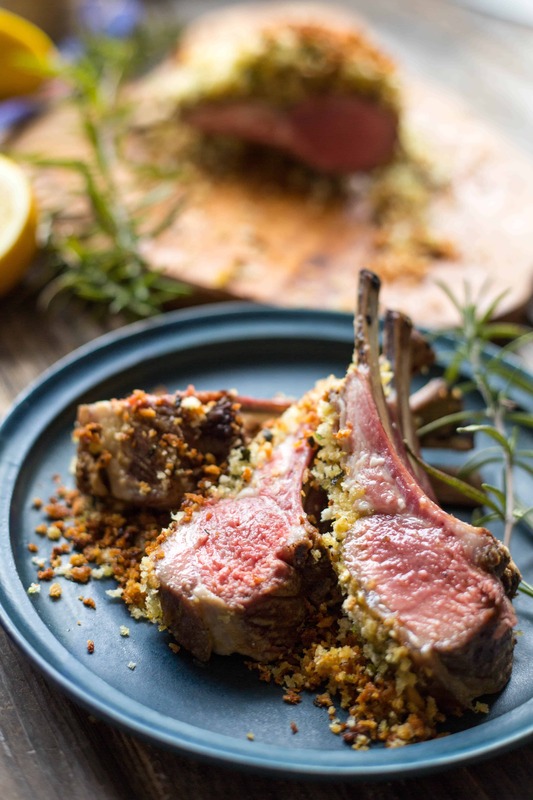 Rack of lamb is not cheap, so why take a chance? With a probe thermometer, all you have to do is stick it in the meat, set the temperature, throw it in the oven and wait for it to beep. You don’t have to stress about whether your meat is overdone or not done enough since it let’s you know the second it arrives at the perfect temperature. This way, you can focus on more important things in the meantime – like making sure you don’t smell like seared meat (always key on date night). This recipe is simple and practically foolproof, but boy what a showstopper. It’s lovely served on any holiday, but I think it’s best when made just for 2. 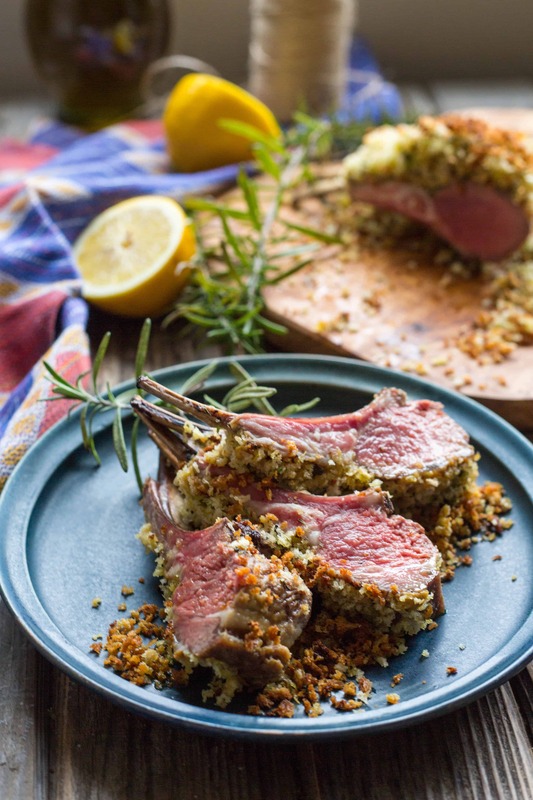 The crunch from the breadcrumbs, the earthy herbs, the meaty lamb and the tangy Dijon just set it all off. You can cut the rack into individual chops if you’d like, but I prefer them double cut because they’re meatier and there’s less breadcrumb loss that way. Now by all means, don’t let me shame you into staying home on Valentine’s Day if you’re really jonesin’ for a night on the town. Going out can absolutely be awesome! But staying in and cooking this lamb would probably-maybe-totally be more awesome (and definitely less expensive). As much as I’m in the camp of thinking Valentines Day is a stupid holiday invented to keep card companies in business, I’m always down for celebrating LOVE: The love I have for all of YOU and especially the love I have for my boo, Chaser. 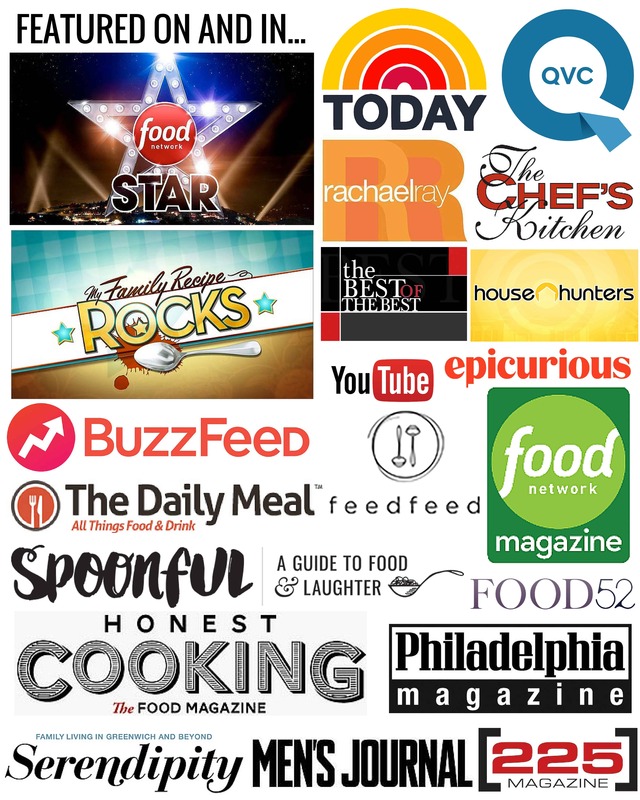 Two Years Ago: Coley Cooks + The Big Kitchen Reveal! Trim the majority of the fat cap off the top of the lamb, then season on both sides with salt and pepper. Heat vegetable oil in a large skillet over high heat, then sear the lamb until browned on all sides. In the meantime, combine breadcrumbs, lemon zest, mint, parsley, rosemary, salt, and pepper in a bowl. Drizzle olive oil over top, then mix until breadcrumbs are thoroughly coated. Remove the lamb from the pan and set on a baking sheet. Spread the Dijon mustard over the top in an even coating, then press the breadcrumb mixture on top. Gently pat the breadcrumbs down so that they stick and form a crust. Roast on the top rack of the oven until the lamb reaches an internal temperature of 130 degrees for medium-rare. If the breadcrumbs are not browned by the time the meat is done, you can broil it until golden. Be sure to watch closely, as it can easily burn. Remove from the oven and allow to rest for 5-10 minutes. Carefully cut into double chops – you will lose some breadcrumbs in the process but that’s okay. Arrange on plates and top with any remaining breadcrumbs. Serve with mashed potatoes, vegetables, or other appropriate sides. Disclosure: This post contains affiliate links in which I receive a very small commission off of any purchases you may make. Affiliate links help me offset the costs of running this website and allow me to bring you quality content on a consistent, continued basis. I appreciate your help. This lamb is making my mouth water. It looks amazing, Coley! Thanks, girl! It’s an awesome recipe! I actually make this recipe with a lovely vermouth sauce. Delicious! nice! I’d love to see your recipe!